What should my parrot eat? Different parrots need different food. Small parrots like budgies and parakeets need a good speciality seed diet supplemented by fresh fruits and vegetables. Larger parrots need a more specialised diet. 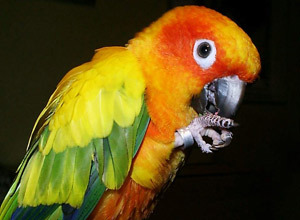 Parrots like e.g African Greys, Amazon parrots, Macaws and Cockatoos often get too much seed and nuts in their diets (especially sunflower seeds and peanuts) and are often overweight. A parrot should not get human food like chips, crisps, rich tea biscuits or chocolate as it is too high in fat and salt for them and can give them diseases. A good diet for a parrot consists of a mixture of fruit, vegetables, seeds, nuts and pulses. Alternatively there are a lot of complete pellet based diets available for parrots. An inappropriate diet can cause your parrot to get vitamin and mineral deficiencies and predisposes it to get health problems. 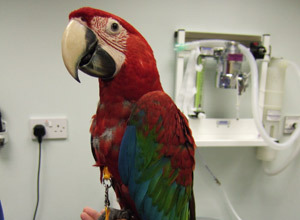 If in doubt as to what to feed your parrot, contact a vet with a knowledge of birds. Can I leave my parrot outside on a sunny day? As long as the bird has access to a shady area and is not placed in a drafty area, short periods of sunlight is good for your parrot. Make sure the cage is escape-proof and avoid leaving the parrot alone outside. Heat strokes kill parrots, so make sure it is not left in the sun for longer periods. Not all parrots talk. Some breeds are good talkers like e.g African Grey parrots and Amazons, but even if you get a traditionally good talker breed, there is never any guarantee that it will talk. Even the smallest budgie can make a great talker given the right circumstances. How much sleep does my parrot need? All parrots need approximately 10-12 hours of sleep in a dark quiet room per night. Is a parrot a good first-time pet? A small parrot can make a good first-time pet as long as you look into what it requires before you buy one. 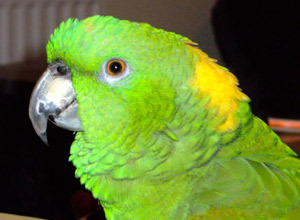 Larger parrots are highly specialised pets, as they are highly intelligent and live for a long time. How do I know if a bird is healthy? Healthy birds are active, bright and their feathers are in good condition. It is difficult to recognise an ill bird as they hide any illnesses until they are really quite sick. A bird should not sit quietly in a corner, fluffed up and not eating. If you think your bird is ill, do not hesitate to take it to your vet, as an ill looking bird is always an emergency. What kind of snake can I get for my kids? Reptiles are in general very difficult to care for and should not be a kid's pets as they need specialised setups and care. If you feel you and your kids can handle the responsibility of keeping a reptile, you should always get the animal and the correct setup from a specialised reptile shop. Corn snakes make good starter snakes as they are generally good feeders and good natured. 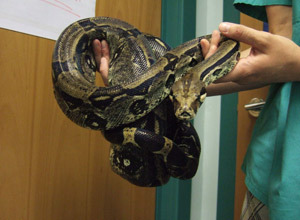 Most of the boas (pythons and boas) are snakes for people who have kept reptiles before. What do I need to do to keep a tortoise? Most tortoises sold today are Mediterranean tortoises. They come from a hot climate and need to be kept in temperatures ranging between 25-30 degrees Celcius. Therefore they need a purpose built vivarium with a thermostat controlled heat mat and heat lamp. Tortoises are dependent upon UV light from the sun for calcium metabolism in order to calcify their shell and make internal organs work properly. UV light can be mimicked by using a special UV light for reptiles. Tortoises are great pets but can become very ill if they are not cared for properly.